You’ll never buy premade BBQ sauce again. This smoky bourbon BBQ sauce is irresistibly spicy, tangy and sweet. It’s the perfect accompaniment to pulled pork, pork ribs and chicken wings. I suppose I’d say I’m a bit picky when it comes to bbq sauce. I have tried many different bbq sauces, looking for the perfect one, but until I made my own at home, nothing was quite right. Many that you buy in the store tend to be too sweet for my taste. I don’t like overly sugary sauce. That’s what makes this smoky bourbon bbq sauce so great. It’s got the perfect level of sweetness, balanced with smoke and vinegar. 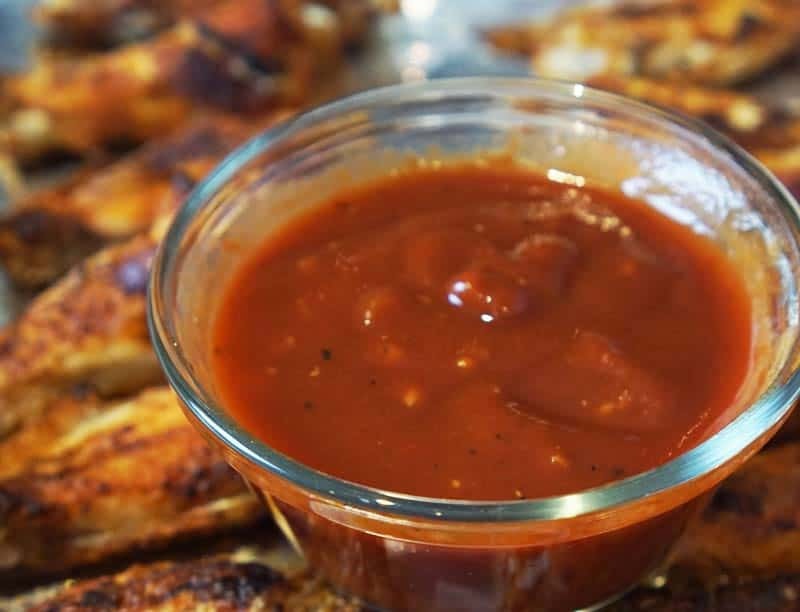 The benefits of making bbq sauce yourself at home are that you can make only how much you need, decide how spicy you want it to be, and set the level of salt and sugar to suit your preferences. Don’t be afraid to adjust the measurements of this recipe to suit your tastes. I try to always keep the ingredients needed for this sauce on hand so I can make it any time I need barbecue sauce. It’s only takes about 30 minutes to make and can be kept in the refrigerator for up to two weeks. The first step to this bourbon bbq sauce recipe is to chop the onions and throw them in a saucepan with the garlic and bourbon to cook down. Keep it on a low heat so the liquid is just simmering, not bubbling or boiling. You can use any bourbon you want. I tend to buy whatever cheap bottle of bourbon I can find. It doesn’t have to be an expensive brand. I really like Bulleit Bourbon and we always have that around, so it gets used often. I like to use hickory liquid smoke in this bbq sauce recipe, but I do experiment with other types. The last time I made this sauce, I used pecan liquid smoke. You might start out with hickory, then try out a few others if you want. You might be wondering why the onions in the recipe are cut into wedges instead of chopped. If you want a smooth sauce at the end, leaving the onions in chunks allows you to remove them easily. If you use chopped onions, you’ll have to strain them out or puree the sauce. After about 10 minutes, once the bourbon has dissipated by half, you can add the additional ingredients to the pan. Stir it well and leave it to simmer for about 20 minutes. Remove the sauce from the heat and allow it to cool. You can strain it to remove the onions, or just pick them out. Then the sauce is ready to use. As you can imagine, this bourbon bbq sauce can be used on just about anything you want. I love it on BBQ chicken wings, pork ribs, and even as a dip for roasted cauliflower. Try it out. I know you’re going to love it! If you like this recipe, why not pin it on your Pinterest board for later! Add the onion, garlic and bourbon to a small saucepan. Simmer on low for 10 minutes until the bourbon reduces by half. Add all additional ingredients and stir well. Bring to the boil, then reduce to medium-low and simmer for 20 minutes. Take the pan off the heat and allow to cool. Strain the sauce into a bowl. Use immediately or store in the refrigerator for up to two weeks.